Thousands of years of history. Greek mythology. Gorgeous islands and beaches. Ancient ruins. Delicious food. Greece has a lot to offer! The varied landscape appeals to all types of travelers, whether you enjoy mountains or beaches, big cities or small villages. While the language might not be so easy for those of us who use the Roman alphabet, you will find plenty of friendly people who know a handful of English words in the touristy areas. 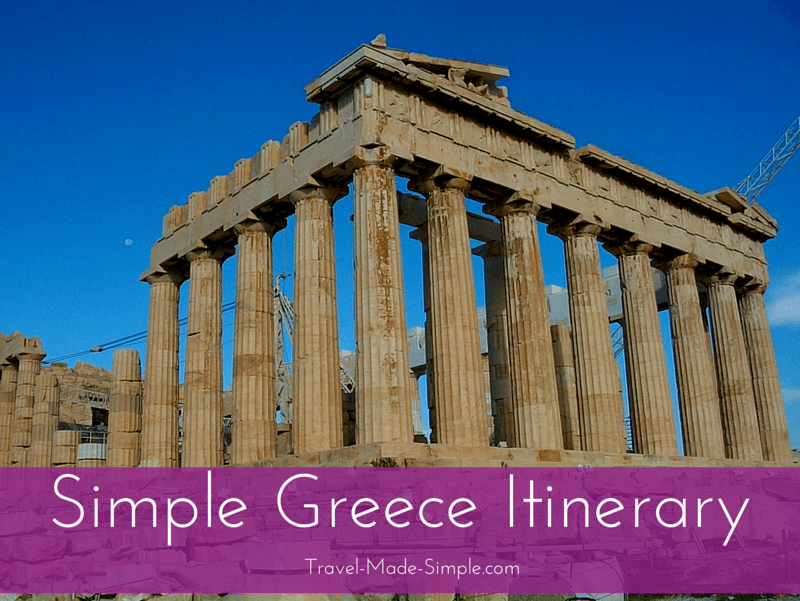 The following Greece itinerary will help you start planning your trip to this wonderful country. How much of Greece can you see in a week? Read on! You can’t see the whole country on one vacation, so your best approach is to pick a few places and spend a few days in each. When visiting multiple islands, it’s usually easier to stick to one island group rather than going from one group to another. Remember that it takes time to get from one city or island to the next, and work travel time into your schedule. One of the oldest cities in the world, Athens is not to be missed. Spend a few days exploring impressive ruins and soaking in the history of the ancient Greeks. Athens can also make a good base for day trips to nearby areas. We typically recommend no more than 2 to 3 hours one way for enjoyable day trip distance, but there are exceptions. Check out hotel reviews in Athens here. The Acropolis and Parthenon – The most iconic site in Greece, the Parthenon sits on top of a hill overlooking the city of Athens. If you do nothing else in Athens, go see the Parthenon and the Acropolis. If you’re visiting in the summer, go early or late in the day to avoid the heat. For the full experience, consider this walking tour of Athens, the Acropolis and the Acropolis Museum, which ends with a traditional Greek dinner with a view of the Acropolis. Ancient Agora – This was where ancient Greeks did their shopping. Today there are some interesting ruins to stroll through. Temple of Zeus – It might just look like a few columns at first, but use your imagination and you can see how big the building once was, despite never being completed. You can also get a nice view of the Parthenon from here. The National Archeological Museum – This museum houses the best collection of ancient Greek artifacts, displaying just how advanced Greek society was. Plaka – This is the oldest neighborhood in Athens. Wander through the streets, stop at a cafe or shop and stumble upon more ancient ruins. Athens highlighst tour – If you’re short on time, a tour that takes you to the highlights of Athens is a great way to see a lot in one day. This half day tour of Athens will teach you about the city’s biggest draw, the Acropolis, along with several other attractions like the Temple of Zeus and the Greek Parliament building. 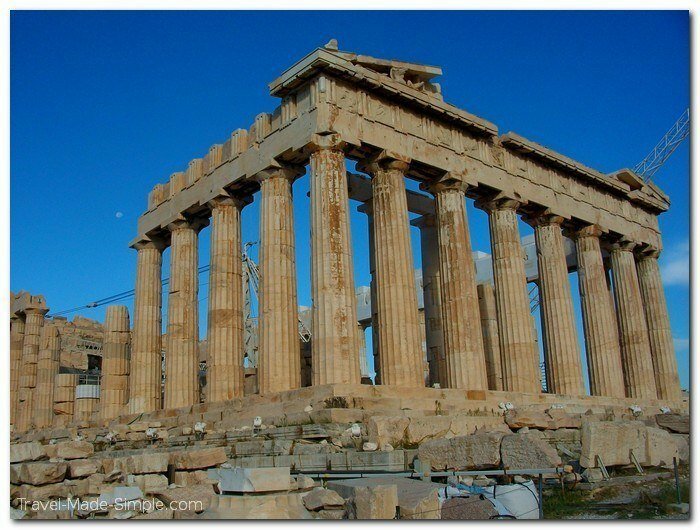 Athens City Pass – If you’re planning on seeing several sights and museums, an Athens city pass could save you money. There are three different versions, all including the hop-on-hop-off bus. Delphi was once concerted the navel of the world. It’s where people came from near and far to ask the Oracle for advice. The advice was purposely vague and interpreted through a priest. There are also theories that she inhaled toxic fumes that came up from the ground while she was giving out her advice. The ruins are impressive and the views of the surrounding mountains and valleys are breathtaking. Visiting the ancient ruins can be done as a simple day trip from Athens on your own, but I recommend taking a guided tour of Delphi to learn about its history and to avoid transport stress. The area of Meteora is a series of monasteries built on top of imposingly high rocks. Monks built the monasteries during the Turkish occupation in order to protect themselves. At the time, they were only reachable by baskets pulled up by rope. It is said that if it wasn’t for these monasteries, Greek culture and history would’ve been lost and modern Greece would be a reflection of the Ottoman empire. Meteora is a little far from Athens to do as a day trip, but if that’s all you have, this day tour from Athens could work. If possible, stay overnight in the nearby village of Kalamaka. You can get a taxi to the monasteries and hike back to town if you want. If you want a more guided option, consider taking this half day tour of Meteora from Kalambaka to get a good look at the monasteries. Another good option is to combine Meteora and Delphi with this two day tour, which starts and ends in Athens. Santorini is the most famous Greek island, know for its gorgeous sunsets, white washed buildings and bright blue domed roofs. It’s in the Cyclades island group, so it’s fairly easy to get from Santorini to one of the nearby islands, such as Mykonos, Naxos or Paros. Search for a great hotel in Santorini here. Sunset dinner cruise – Take a sunset dinner cruise for a romantic way to enjoy Santorini and its most famous attraction. Volcano tour – A variety of different but similar tour operators will take you by boat to the volcano that shaped Santorini. They’ll also take you to Thirasia (the smaller island across from Santorini), the hot springs, and then to the town of Oia to watch that famous sunset. 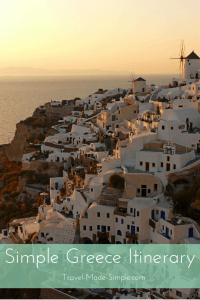 Oia Sunset and Villages tour – If you prefer to stay on dry land, consider a tour of some of Santorini’s traditional villages and the archeological site Akrotiri, and end the day by viewing a gorgeous sunset from Oia. Beaches – An obvious thing to do while on the island is go to the beach. Two popular ones are Perissa and Kamari, where you’ll see the sand that has been blackened by volcanic eruption. Akrotiri – This is Santorini’s version of Pompeii. It’s an archeological site where an entire city was preserved by a volcanic eruption. Come early to avoid the crowds. Wine tasting and vineyard tour – All that volcanic soil makes for some amazing wine. Visit some of Santorini’s wineries and taste the different varieties of local wine. Looking for an adventurous island experience? Check out this review of a Greek island hopping sailing tour! The Cyclades are an island chain in the Aegean. This is probably the most popular island chain for vacationers and party-going backpackers, but don’t let that stop you from exploring. Santorini is the southern end of it and one of the gateways to the islands. This is a short list of some of the islands. There are plenty of others each with their unique sights. White washed town streets and shady cafes looking over blue waters are standard scenery. Ferries link most islands and there are airports on both Mykonos and Santorini. Spring and fall are the best time to come when weather is reasonable and there aren’t as many tourists. Summer is hot and crowded and a lot of things are closed in the winter (including some of the ferry routes). Mykonos – Mykonos is near the northern end of the Cyclades chain and closest to Athens of the most popular stops. It is well known for its windmills and a town full of narrow whitewashed lanes with plenty of nightlife. Naxos – Largest of the Cyclades islands. Former temple ruins stand in the harbor. Exploring the island by four-wheeler is quite popular. Ios – A well known party haven. Koufranissia – A small island off of the main party trail of the island chain. It is a relaxing hike around the rugged island coast and a place to sleep through the afternoon siesta. Milos – A less touristy island, Milos is just as gorgeous as its neighbors but without the crowds. The most famous islands in Greece are in the Aegean, but they are not the only islands in the country. The Ionian Chain is off the west coast toward Italy. Corfu – An extremely popular tourist destination, Corfu island is studded with resorts. Historically Corfu has been owned more by the western European nations than by Greece and was fortified against the Ottomans. This has left a number of castles around the island and in the main city to explore. There are a number of museums on the island as well as the various natural features of the wider island. Zakynthos – A rugged island with beaches and cliffs. Navagio beach with a famously beautiful shipwreck is reachable only by boat from the capital city of the island. The capital, called Zakynthos just like the island, was once ruled by the Venetians and still has a castle from that era. The island is also involved in protecting the endangered loggerhead turtle which has a breeding ground there. These islands are in the Eastern Aegean near Turkey. This area has been ruled by different groups over the centuries, like the Turks and the Italians as well as the original Greek, and it shows in the various architectural styles. Rhodes – The former site of the Colossus of Rhodes, one of the ancient 7 wonders of the world. It is now a island of castles, resorts, and history. Beyond the main arrival town of Rodos, check out Lindros and Monolithos for medieval castles. Kos – Along with being the birthplace of Hippocrates, known as the father of medicine, Kos is well known for its many beaches. It too has a castle in the main city. Greece’s largest island of Crete sits south of the rest of the country in the middle of the Mediterranean. It is said that it is diverse and different enough from Greece that it could be its own country. If you want an island place to explore but without having to get on a boat all the time, you could easily spend an entire week in Crete. Crete was the center of Minoan civilization and the place of several myths including the Minotaur. The capitol city of Heraklion has a Venation fortress and the former Minoan palace at Knossos as well as a number of museums. The island has many natural beauty spots and a diverse set of landscapes to explore. Beyond that, there are a number of towns with their own feels spread about the island. The island has plenty of resorts as well, but it is worth exploring the real island even if you are there mostly for the sun and the beach. Want to explore Crete with a tour? Search for tours in Crete here. Some tours take you to parts of the island you might not normally get to on your own. While the islands are very popular destinations in Greece, there are plenty of other interesting things on the mainland as well. Thessaloniki – Greece’s second largest city lies in the north of the country. It is known as a vibrant cultural center. City walls and several towers still show its medieval shape. Just explore the city or take a food tour. Halkidiki – The hand shaped peninsula extending into the Aegean near Thessaloniki is an area of rugged cliffs, natural beauty, and beaches. Mt Olympus – The mythical home of the Greek gods is not far from Thessaloniki. Peloponnese Peninsula – The large peninsula south of Athens is home to a lot of the places from Greek mythology and classical history. Corinth, Sparta, Mycenae, and Olympia (home of the original Olympic games) for example. This is a pretty large region and, like the rest of Greece, has plenty of beaches and smaller towns to explore as well. Athens is the easiest entry point into the country, so I recommend starting your trip there. You can fly to some of the more popular islands like Santorini, but there is a certain charm to going by boat. It just takes a bit longer that way, especially if you’re going farther out like to Rhodes or Kos. Many of the smaller ferry routes are more limited (or closed) in the winter. Even in the summer, schedules seem fluid in Greece. Pireaus is the ferry port near Athens that has links to most destinations in the Aegean. Patras is on the western coast of the mainland and has links to the Ionian chain of islands as well as overnight ferries to Italy. Check out our post on transportation in the islands. While exploring mainland Greece, if you don’t sign up for day tours, you can get around by long distance bus or train depending on your destination, but bring your patience (and a snack) because things don’t always run on schedule. Choose a few destinations for your Greece itinerary and enjoy them. As always my advice is to travel slowly. Take into account the time it takes to get from one place to the next. This is especially true in Greece. Pretty much expect to use most of a day to move long distances and note that certain ferry routes leave very early in the morning. Even if transport is on time and you have extra time to explore a city, it is better than missing a tour or flight. Day trips that include bus transport can thus be quite helpful if you want to see a lot with your time. If you really enjoy cities, consider adding a day or two in Athens. On the other hand, if you’re more of a beach person, consider adding time to you stay on Santorini or go island hopping throughout one of the island groups. Enjoy the beauty, the history and the food in this wonderful country. This is a very island focused idea of a week. You could easily stop at an additional island in the Cyclades for a night instead of 2 in Mykonos if you were willing to deal with moving around more and work with they ferry schedule to make it happen. Read our post on island hopping in Greece. 2 Days – Athens: Explore the ancient sites. 1 Transport Day: Ferry or fly to Mykonos. The Blue Star Ferry leaves at 7:30am and takes 6 hours. There are several flights a day from Athens as well. 2 Days – Mykonos: Explore town with the windmills and the winding streets. 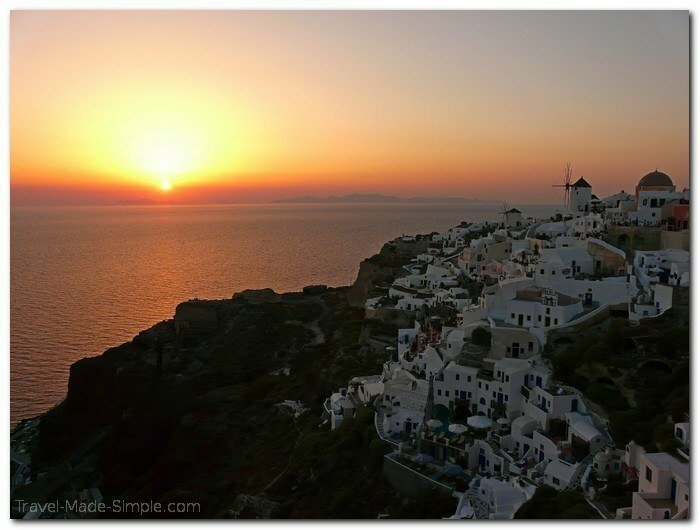 2 Days – Santorini: Head out to the Volcano one day and up to Oia the next day to catch the sunset. Alternatively you could aim to explore the mountains and sights on the mainland. Head up to Thessaloniki for a different city to explore. 2 Days – Meteora/Delphi: There is public transport that gets you to Meteora and Delphi, but they are odd schedules and long rides. It is great freedom if you have an extra few days to spend, but if you do not, look into a combination tour from Athens like this one. 3 Days – Thessaloniki: Take the express train or a long distance bus north to Thessaloniki. Explore the old buildings and food of Greece’s second city and take a day out to experience the nature and beaches on Halkidiki peninsula. 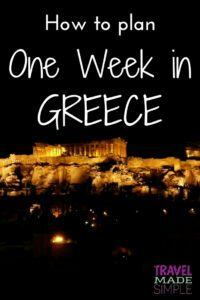 Hopefully our Greece itinerary and ideas for planning one week in Greece have been helpful. The following posts provide more in-depth information about Greece travel, tours in Greece, and specific cities and regions. And if you’re looking for a little inspiration, be sure to check out the books and movies recommended below. The Iliad and the Odyssey – The classic Greek epic poems as translated by a modern scholar makes them more accessible to today’s reader. Mamma Mia – A fun musical movie set on a Greek island about a girl who is about to get married, the relationship she has with her mother, and the three men who could be her father. Thank you for this post Ali 🙂 My mother has been to Greece numerous times but I have never been. After reading your post I feel that this could easily be doable. Thanks Matthew! Greece is a wonderful country, I hope you make it there someday. Just writing this post made me want to go back! Hi Ali, this is Luciano, and I wanna make it to Greece in January as it will be my honeymoon destination. I’d love to be in Santorini as well as I would love to see those ancient ruins of the Greek history. Don’t know how to proceed. Want to keep my Greece vacation to 4 – 5 days max. From there, i’m planning Paris. Have never traveled to Europe, so just wanted to know if I can really make it like that. I have just about 10 days and want to make this trip and just would want to have a blast. I would really appreciate your feedback to know about the possibility of doing it or not. Hi Luciano! I think 4-5 days is a bit tight, but if that’s the time you have, it’s doable. First, know that the Greek islands are not the most active that time of year. That said, it might be kind of nice to be in Santorini without the crowds. Very informative stuff here! Thanks for sharing. I just booked a quick 6 night trip in to Athens for the last week of March. Do you have a detailed suggested itinerary for the six nights my main concern is should I base all six nights in Athens and take day trips, day cruise to Hydra, tour to Delhi, etc. or should I spend the beginning part and Athens in the middle possibly nafpoli? Then return back to Athens for the last night? I’m very confused we are regular Travelers however Greece has me stumped!! Thanks Ally! I think it really depends on how much beach time you want. I’m not familiar with Nafplio, but staying there or another coastal town or a closer island could be a nice change from Athens. I think 2-3 days is plenty for Athens itself, and it does make a good base for a day trip to Delphi, and a day cruise to Hydra could be fun too. If you’re more of a city person, you might enjoy having some extra time in Athens, but personally I think a big reason for going to Greece is the islands. So that would be my vote, 2-3 days in Athens and a couple days somewhere else coastal or on an island. Nafplio has the advantage of being not too far away from Athens, and if you want a day trip from there, there are some interesting ruins in Corinth. Another option, if you’re not so interested in the beach stuff, is to do a trip that combines Delphi and Meteora. This is a 2 day tour that starts and ends in Athens and goes to both Delphi and Meteora. I hope this helps! I love itinerary guides! Thanks for sharing! Definitely bookmarking this one as Greece is on the top of my travel list. Thanks Lauren! I love all the history you can explore in Greece, plus it’s just a gorgeous country. I hope you have a chance to travel there soon! Do you have any packing guidelines for Greece? I am finally fulfilling my dream trip itinerary and will be going island hopping over there this month for 2 weeks and I only want to bring carry on luggage. I am a fashionista at heart so editing clothes and shoes has been a challenge to say the least. I have also been checking the weather and although the days get warm, the nights can still be chilly this time of year which makes for more packing confusion. Thanks Stina! Congrats on booking your trip to Greece, should be lots of fun! I think you can totally do it carry-on only. Try to pick outfits that all go with just one or two pairs of shoes so you don’t have to bring so many pairs. Shoes take up a lot of room. On occasion I have hung shoes on the outside of my bag. For cooler nights, you should be able to get away with just one pair of pants and bring a light cardigan or jacket. Layering is a good way to deal with colder temperatures without having to pack too much extra clothing. And the good thing about a jacket or cardigan is you don’t have to pack it in your suitcase, just carry it so it doesn’t take up any precious space. I often get cold on planes anyway, and carrying a jacket doesn’t count as another carry-on. Remember that you’re likely to be in a bathing suit a lot of your time over there, and when you’re not at the beach, you’ll want to wear comfortable shoes. A lot of the islands are hilly and have cobblestone roads, or sometimes even dirt roads, so you won’t want to walk around in heels. 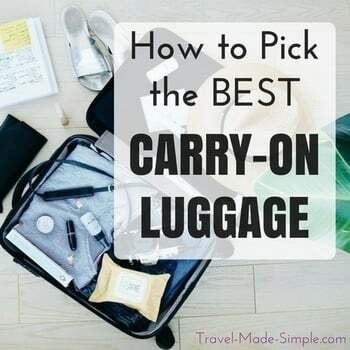 I think the best way to be comfortable, fashionable and carry-on only is to pack a few bathing suits, a few t-shirts and shorts for daytime, and a couple of cute dresses/skirts or pants and a couple of cute tops for nighttime. Comfortable walking shoes, flip flops, and one pair of cute shoes for nighttime should work. I cut back on clothes by eliminating options. Don’t pack 2 nicer outfits if you really only need one, and don’t be afraid to wear the same thing a few times. Bring a basic skirt or pants (like black) and wear different shirts with it each night, that kind of thing. You’re the only person who will know you’re wearing the same black pants to the bars 3 nights in a row. And don’t forget, you can do laundry over there! Two weeks is kind of a long time to go carry-on only without doing laundry, so see which island you’ll be on around the halfway point and either have your hotel/guesthouse do a load of laundry for you (if they offer the service) or ask around for a laundromat or someplace that can wash your clothes for you. Just make sure the clothes you bring are machine washable, not dry clean. I hope this helps, but if you have any other questions, feel free to email me! Have a great time in Greece! Thanks Ali, those suggestions help a lot! Thanks for sharing! Brainstorming a potential trip back to Greece and bringing my parents who’ve never been before. There’s so much to do and see, it’s tough narrowing it down to a single week. I missed Meteora and Delphi last time so it’s on the list for a future visit! Thanks Shannon! I really liked Delphi. I didn’t make it to Meteora, but my husband went on his trip and loved it, so now I want to go whenever we get around to planning another trip there. Enjoy your time in Greece! We’re taking our 12 year old daughter on a one week trip to Greece in July. She’s mature and we don’t have to dumb it down for her. We like culture but also nature (hiking, water sports, etc.). So I’m thinking maybe a day or two in Athens and the rest on the islands. Anything specific you can recommend for us to do? Any small group walking tours? Thanks. Hi Gary! Not sure if you’re interested in any day tours on mainland Greece, but something like this one that goes to Meteora could be good. 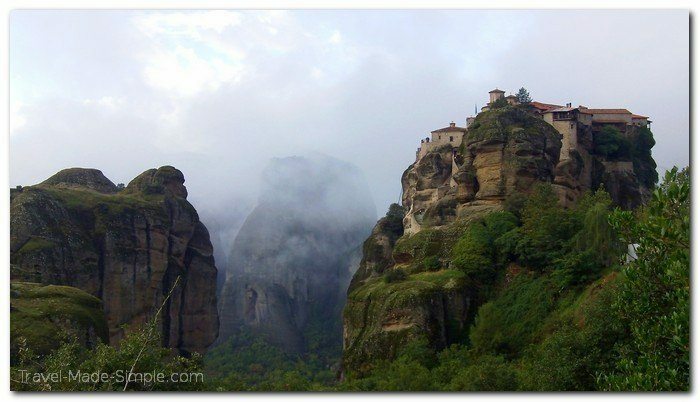 I didn’t make it to Meteora but my husband did when he was in Greece and loved it. Gorgeous landscapes, interesting history, and the monasteries are spread out in a ridge and you can hike from one to the next. 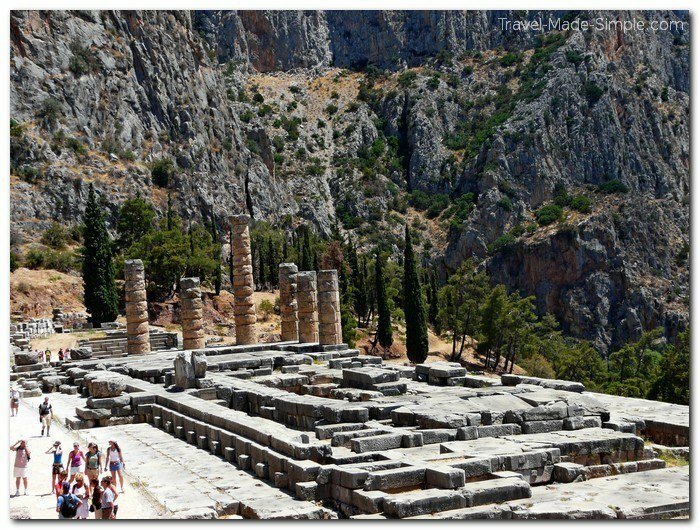 I went to Delphi on a tour similar to this one which has an interesting history too. As for the islands, I definitely recommend Santorini. It’s the most popular, so there will be lots of other tourists around, but it is simply gorgeous! I took a volcano tour, which you can easily book once you get there, and they take you out to the volcano by boat. You hike up the volcano (probably a light hike for you if you hike a lot) and then they take you to some hot springs, the little island across the way, and then back to Oia on the main island where you can watch the sunset. You can do any number of water sports at almost any island, so it’s just a matter of doing a few searches for more specifics you’re interested in to see which islands are best for what you want to do. There are tons of tours of all different kinds, depending on the islands you choose. Again I looked for Santorini, and if you look here you’ll see a bunch of options. I hope this gets you going in the right direction! Thanks for such a nice site. I have started finding useful information here compared to other sites. But I still wanted to have your opinion about our trip. We are family of four – myself, wife, 21 & 13 years old daughters. This is our first time in Greece. We are planning to visit in mid July for 7 days from USA – this includes our flights too. How our sample itinerary should be based on full 5-6 days. We want to visit and see both Athens and Santorini at minimum. We would highly appreciate your recommendation and detail information. Hi Akim! I think Athens and Santorini sound great. You can see the major highlights of Athens in a day or two if you’re ok with packing in the activities/sightseeing. I’d say at least 2 days for Santorini so you can really enjoy the beauty of the island. You could think about a day tour from Athens to Delphi, which is an interesting place. There’s a little more info about Delphi in the post. That probably fills your 5-6 days, especially when you take into account the time it takes to get to and from Santorini, whether you decide to fly or take a ferry. If you have 6 nights, *maybe* you could do a 2 day/1 night tour to Delphi and Meteora from Athens. Since you’ll probably have to get back to Athens for your flight home, it might be worth saving your Athens sightseeing for the end. You could book a flight to Santorini the same day you arrive and spend 2 nights there. Then fly back to Athens early in the morning and spend the rest of the day seeing Athens. Then the next day, start the Delphi and Meteora tour, and come back to Athens for another 2 nights. Or if the Delphi/Meteora trip feels like too much, you could spend 3 nights in Santorini and 3 nights in Athens and do a Delphi day tour. If you only have 5 nights, it might really be a stretch to do the Delphi/Meteora trip, but Delphi on its own is probably still doable. I don’t think you’ll have time for any other islands though, but you’ll get a nice taste of Greece in this time. I hope this helps! When a three day complete pass is purchased, does that mean three consecutive days or three days in any order? Also we are in the US and will be in Greece in a week. Can we pick up the pass since we do not have six weeks to wait? Hi Harriet, I think you’re talking about the Athens city pass, right? You’d have to contact the booking company to see if there are an other options for getting the pass. You could try having it mailed to your hotel but I see that the description says up to 14 days for EU countries other than Germany, Austria, Switzerland. It looks like there is an express delivery option, that might be your best bet. I think it’s still worth looking at whether they can send it to your hotel. (Although the company that actually issues the passes recommends NOT sending it to your hotel: https://www.turbopass.com/shipping) Give them a call and ask what your options are. You could also check with the Athens tourism board and see what they offer that can be purchased when you get there. Hi Ali! I’m planning a trip to Greece for hubby and myself in either early-May 18′ or mid-Sep 18′. We may only have about 7 days or maximum 9 days for the trip including travel time. We would be flying from NY to Athens to start. Do you think it’s possible in our short time frame to explore Athens then visit Santorini (via ferry) and then visit Mykonos (via ferry) and then back to Athens (via ferry) for our flight back home in a matter of 7-9 days? I planned it out and it feels like it might be a lot of packing up and moving to the next place in such a short time. We’re in our late 20’s and early 30’s – fit and active folks who travel often, but I do want to enjoy each island a bit before rushing off to the next. We’re more island lovers so feel like we could spend less time in Athens, but we need to pass through there for our flights (flights into and out of the islands are too expensive) so figure we spend 1.5-2 days max in Athens. Wondering if we should just do Athens and Santorini instead if it’s too tight to do 3 locations? What do you think?? It’s so hard to decide what to do! Hi Tania! First, I think it’s fine to not spend too much time in Athens. There’s a lot of great stuff there and the Acropolis is a must, but honestly, it’s not my favorite city. If you’re flying from the US, you’ll arrive in Athens early in the day but probably too late to get a ferry that day, so you could spend that day sightseeing in Athens and trying to keep yourselves awake. Then get the ferry to Santorini the next morning. As for how much time to spend in Santorini and whether you’ll have time for Mykonos, I think it depends on what you want to do. If you think having to pack up and change locations every few days will be stressful, then just do one island. If you want to do lots of tours and still have time to just sit and relax, you might want to stick to one island. Look at the activities you’re interested in and how much time you’ll be left with after that. Decide if you want beach time. If you’re not interested in every single activity available, it might be nice to go to Mykonos and see another island. I’d start by sketching out the things you want to do, including if you enjoy simply sitting on the beach or at the pool or at a cafe and reading/enjoying the views. Account for the transport time – you’ll probably lose half a day every time you move from one location to the next. See if what kind of time you have left and if it feels rushed to go to Mykonos. If you think you could work it out to have 3 nights in Santorini and 3 nights in Mykonos, you might be fine, considering that’s basically a little over 2 days in each place. Sorry I can’t make the decision for you, but I hope this helps you work through your options! And no matter which you choose, I think you’ll have a great time, Greece is gorgeous! We are coming to Athens Greece in May and will have 6 days. 14 of us. 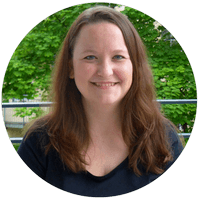 We were thinking of flying to Santorini and then back to Athens and renting a car and doing a loop – Nafplion, Olympia, Delphi and back to Athens. Are we trying to cover too much ground. From what I can read on this site, I think we would be best 2-3 days in Athens(day trip to Delphi), and 2 nights in Santorini. Any insight would be helpful for the best use of 6 days! Were spending 10 days in Italy and I’m thinking maybe we better steal some days away from there haha. Hi Dianne! It does sound a bit rushed to me, especially with such a large group. You’d probably be fine with 2 days in Athens and 2 days in Santorini. Maybe you could then take the other 2 days to rent a car and see Delphi and the other places you listed? It’s probably worth getting on Google Maps and plotting out the towns you want to visit and see what the times and distances are between each place, and bump up those times a little to give yourself a cushion. Then you can decide how many hours per day you’re willing to spend in the car. For example, when I map out Athens to Delphi, it says it takes almost 2 hours 30 minutes. I’d probably round that up to 3 hours to be safe. And then you probably need a couple hours (at most) to explore the ruins. So basically it’s sketching out your activities and driving time and meal times a little more than you normally might to make sure it looks realistic to do all those things in 2 days, especially since Delphi is the opposite direction from Nafplion and Olympia, and decide where it makes sense to stop for the night. Also, think about if you want/need any relaxation time in there. Santorini is probably not going to be action-packed, but try not to exhaust yourself on your trip to the point where you need a vacation after your vacation! Anyway, I hope this helps! My family and I (mom, dad, sister) are going to Greece in late March this year. Your suggestions were really helpful! We will have 6 nights and we’re thinking of doing 1-2 days in Athens, 2 days in Santorini, and either Mykonos or Milos (had never heard of Milos before but after reading your post I’m leaning more towards it than busy Mykonos). Do you think it’s ok to skip Mykonos and go to Milos instead or will we be missing out? Also, 1 day seems enough to see everything in Athens, so for the other day do you suggest Delphi or Meteora? Or just skipping day trips altogether? We do prefer the islands over cities. Hi Olivia, apologies for the late reply! I do think 1 or 2 days is enough for seeing the highlights in Athens, or 1 day in Athens and another day doing a day trip to Delphi. If you’re more interested in Meteroa, certainly check out the day trip I have linked above in the itinerary, just know that it’ll be a long day. I don’t think you could do Meteora and Delphi in the same day though, so you’ll have to pick one. Meteora might be a little more impressive, but Delphi is still worthwhile and easier to get to as a day trip. As for the islands, remember that late March will still be a bit cold. This also means you probably don’t need quite as much time since it’ll be too cold to swim, so that’s a plus. I don’t think you need to worry about “busy” though. March is definitely the off season, so if you want to see Mykonos, go for it. It might also be tough to visit Milos that time of year since it’s a smaller island and lots of things might be closed. I don’t necessarily think you’ll be missing out if you skip Mykonos, but I do think it might be a better choice in March when you’ll find more hotels and restaurants open on Mykonos as compared to Milos, and there won’t be big crowds. Hi Karen! With two weeks in Greece, you could spend maybe 2 or 3 days in Athens, a few days each in Mykonos and Santorini, plus maybe even one other island in that same island group, and I’d also recommend Delphi and Meteora. You could do a day trip from Athens to Delphi, but Meteora is a bit far for a day trip in my opinion, so best to stay overnight there. There are also 2-3 day tours that combine Delphi and Meteora if you don’t want to do it on your own, like this one. And in case you didn’t want to go to Santorini and Mykonos, but instead to someplace new, consider Rhodes and Kos. They’re both supposed to be gorgeous islands (I haven’t been yet but I want to!) and they’re farther east, towards Turkey. I just came across your page as I am beginning to plan my solo trip to Greece. This is a big deal for me since I have never really travelled alone other than to business events. In reading you post & comments I will surely keep my time in Athens limited. My time is somewhat flexible and I was kind of thinking maybe fly into Italy for about 3 days then travel by plane or train I guess to Greece for no more that a week. My image of my trip is one like you would see in the movies where the middle aged single woman roams around getting immersed in the culture…umm…have you seen Eat, Pray, Love? Lol. I am concerned about safety & also maybe feeling a bit lonely if that makes sense. I hear that the people are very welcoming. Any advice you can give would be appreciated for sure! I will be sure to check out the links on your page as well. Hi Kathy! Greece was my first solo trip too, you’ll love it! Just remember Eat, Pray, Love takes place over the course of one full year, so she spent several months in each place…you can’t get the same type of experience in a week unfortunately. But if you’re interested in more culture, as opposed to simply seeing the sights, I’d suggest looking for unique tours, like a cooking class or something that takes you to a less touristy area. It also helps to travel a little more slowly, so instead of trying to visit 4 places in a week, aim for 2 maybe. Athens has some good stuff, definitely worth seeing the Acropolis and some of the other ruins, but it just didn’t grab me. That said, since it’s not quite as touristy (outside of the main attractions) as the islands, you could get a little more of a locals feel. As for feeling lonely, yep, it’s definitely something that happens occasionally when you travel by yourself. BUT that’s ok sometimes. Make sure you have lots of books to read, load up your Kindle. If you’re traveling with a laptop or tablet, you can watch Netflix or similar at night if you’re back in your room. I usually try to have lots of activities to keep myself from feeling too lonely. Even if I just have those activities researched but not booked, it’s helpful to know I have options if I need them. But yes, everyone was friendly to me, and I never once felt unsafe. Just be aware of your surroundings, don’t flash your money around, don’t get super drunk, make sure you have a business card from your hotel with the address on it in case you get lost. I have a handful of articles about solo travel here. And lastly, for getting from Italy to Greece, your best option really is to fly. They don’t share a land border, so it would take you a few days of trains and buses through several countries to get to Greece. You could take a ferry, but they’re usually about 8-10 hours overnight, not super comfortable, kind of expensive to get a cabin (as opposed to just a seat) by yourself, and I don’t think any of the ferries from Italy to Greece go to Athens, so you’d still have to get a bus for several hours once you arrive. I highly recommend just hopping on that quick flight! Oh, and aside from all the Greece links on this post, I also have an Italy itinerary here with a bunch of links to other Italy posts at the end. I’m not sure where you’re going in Italy, but hopefully this will help! Enjoy your trip! What’s the best way to get from Mykonos to Santorini? Fly? Hi Kristyn! That sounds like a great plan. In Santorini, I actually did a volcano tour that ended in Oia in time for the sunset, so you can probably do something similar. For getting from Mykonos to Santorini, check out this site and this site for ferries. I just picked a random day and it looks like there are a few options a day, most around 2-3 hours. When I search for flights, I’m not finding anything direct, they all connect through Athens, which might be more of a pain than it’s worth. The ferries looked cheaper too. Have a great trip! Hi Naghma! Airbnb is a good place to look for apartments when you travel, that way you’ll have a kitchen. For such a large group, you might need to book a couple of apartments in each place, unless you luck out and find some bigger than average places. Be sure to check if the building has an elevator if your sister needs that, or at least contact the owner and ask how many flights of stairs there are if it’s not mentioned in the description. But also know that there are ways of eating out and sticking to your vegetarian diet. Most restaurants have multiple options, and some are bound to be meat-free. I know you said your sister can walk, but not for long distances, but I did a search for visiting the Acropolis in Athens with a wheelchair, seemed like the quickest way to find info. So it sounds like there’s an elevator, but she might need some sort of documentation from a doctor or she might need to rent a wheelchair for the day to use the elevator. The info is a few years old, but this should be a good starting point for you to do some more research: https://www.tripadvisor.com/Travel-g189400-c144005/Athens:Greece:Use.Of.The.Acropolis.Elevator.html. March might not be the best time for the islands since the weather is still kind of cool and many islands all but close up for the colder months. That said, more popular ones like Santorini will still have lots of options. You’ll probably to make sure your ferry takes you to the new port, which is where you can arrange for a car to pick you up, as opposed to the old port where the donkeys are. Honestly, I might not be the best person to help you plan a trip involving someone with some mobility issues because I’m not sure what kinds of things your sister needs to look for. I rarely recommend contacting a travel agent, but that might be a good option for you in this case. I looked at the tour companies I usually recommend, but they don’t seem appropriate for the kind of trip you’re talking about. Look into staying at an Airbnb. No problems accommodating several people. And cooking facilities. Food is definitely affordable though when eating out. I’m planning a 7 days trip to Greece, Can u recommend places I must visit and when should I go? I’m planning to go to Athens, Mykonos,Crete,Santorini and Delphi and if I have time also Naxos too. Can u recommend the best and convenient way of traveling ? I wanted to go to various places like islands ,beaches and all the Arcopolis. Hi Prang! I think that’s way too much for 7 days. Don’t forget there’s transport time in between all of these places, and you’ll lose anywhere from a couple of hours to most of your day. Crete especially is a HUGE island. I’d probably recommend 2 nights in Santorini, 2 nights in Mykonos, and 2-3 nights in Athens, and go to Delphi as a day trip from Athens. If you’re really ambitious, maybe you could squeeze in a night in Naxos. But really try to look at what you want to do and see in each place and think about how much time you need for activities, meals, transport from one place to the next, getting to your hotel, having to get to the airport, being at the airport an hour before your flight, etc. The fastest way between Athens and the islands is to fly, but between Santorini and Mykonos, I’d recommend the ferry because there are no direct flights and you’d have to connect back through Athens. THank you really much! You’ve help me alot! 7 of us former college friends are planning a trip to Greece in September 2019. One place we want to go is Sparta because 2 of the girls family is from there. We plan 1 week with friends and husbands will join for the second week. Suggestions? We are in our middle 60s, varying levels of fitness. If we go at the end of September and first of October will we miss things that might be closed that time of year? Hi Mary! I wouldn’t worry about much being closed at that time of year, unless maybe you were planning on going to some really tiny, off the beaten path island. But the main sights – Athens, Santorini, Mykonos, etc. – will be fine. Things will still be open but there will probably be fewer tourists, which might make it more enjoyable for you. As for where to go, that really depends on what you’re all interested in. I’m not a huge fan of Athens, but some people love it, and no matter what I think the Acropolis is a must see sight. Santorini and some of the other islands in that chain are gorgeous and well worth a visit. On the mainland, I liked Delphi (easy enough day trip from Athens) and my husband went to Meteora and loved it. But if your main goal is to hang out with your friends, you might not want to plan anything too fast paced. A friend has recommended this agenda: Athens – Sifnos – Santorini – Naxos – Athens – home. My family has two weeks to play with. I was considering adding Thessaloniki in there. Would that be too much? And how would you suggest we divvy the time up then? Hi Francesca! You probably want 2-3 days per island and 2-3 days for Athens, depending on whether or not you plan on doing any day trips from Athens and how much of a museum person you are. I’m not really a museum person, so I was fine with about 2 days (or even a day and a half) in Athens to wander and see the Acropolis and lots of other ruins, plus another day for a day trip to Delphi. So adding Thessaloniki might be pushing it a little, but it’s not impossible. It just depends on how many activities you like to do while traveling and if you’re ok with a fast pace. Also make sure you account for transport time. It takes several hours by fast boat or ferry to get from Athens to the islands, and then time to get from one island to the next. Flying is faster, but remember to account for time to get to the airport before your flight and getting to the airport. And you pretty much have to take the ferries to get between those islands. There might be some flights, but they connect through Athens, and I feel like that takes too long. I recommend getting the ferries as early in the day as you can tolerate so you still have most of your day ahead of you when you arrive. If you changed the order a little, you could do Athens-Sifnos-Naxos-Santorini-Thessaloniki-Athens. So maybe 2 days in Athens (assuming no day trips) then take the ferry to Sifnos for 2-3 days, ferry to Naxos for 2-3 days, ferry to Santorini for 2-3 days, then fly from Santorini to Thessaloniki (looks like Olympic Air has a direct flight several days a week) for 3 days, then fly back to Athens the day before your flight home. For each of the islands, I put 2-3 days, but you might have to choose just one or two islands to have 3 days. I suggest researching what you’re interested in doing/seeing in each place and sketch it out. How many things do you want to do and how much time do you need for each thing? If you’re like to wander and take in the views but you mostly want to relax, you probably don’t need tons of time in each place. But if you want to do lots of tours, go to lots of museums, see every set of ruins, etc. you might feel rushed trying to go to all of these places, and you might want to cut one out. I hope this helps! Very helpful, indeed! Thank you so much Ali. It is appreciated. Hi Fiona! I’m not sure what exactly your question is. Are you talking about a birthday dinner or something during your vacation? If so, I’d suggest researching some restaurants in whatever city/town you’ll be in and see which ones have good reviews and see if they have an email address to make a reservation. You could also contact your hotel and ask them to make the reservation for you. As far as things to do in Greece with kids, it really depends on what kinds of things he likes. There are tons of beaches if he likes swimming. I wouldn’t try to do too many locations with a kid since transport days can be stressful, so maybe Athens plus one or two other spots. My name is Tonie, I want to book a trip to Greece in October for my birthday. I found this amazing hotel but it is in Rhodes please help me as a trip guide. A n island close to Greece would be nice, being that i can just hope on a ferry over to Greece. Please help me. Hi Tonie! I haven’t been to Rhodes yet, but I’ve heard it’s amazing. I’m not sure what you’re asking exactly, but Rhodes is pretty well connected to Athens by flying. There are ferries from Athens (and a few islands) but it’s a long journey, so you’re probably better off flying if you’re coming from Athens. Search for something like “things to do in Rhodes Greece” to find more info on what to do there. Hi! I’m planning a trip to Greece around my friends wedding in Naxos, I’ve booked my flights but that’s about all I’ve got so far! I’m flying out of the US on a Sunday & arriving early mon morning in Athens. The wedding in Naxos is Thursday, just trying to figure out the best order of going places. I would like to also go to Mykonos & santorini. I fly back on the following Wednesday. Any tips would be greatly appreciated, thanks! Hi Stephanie! It doesn’t sound like you have a ton of time, so don’t try to squeeze in too much before the wedding. I’m not a huge fan of Athens, but the Acropolis is definitely worth seeing. You could go there, plus maybe some other sights in the city, the day you arrive and even spend Tuesday exploring Athens. 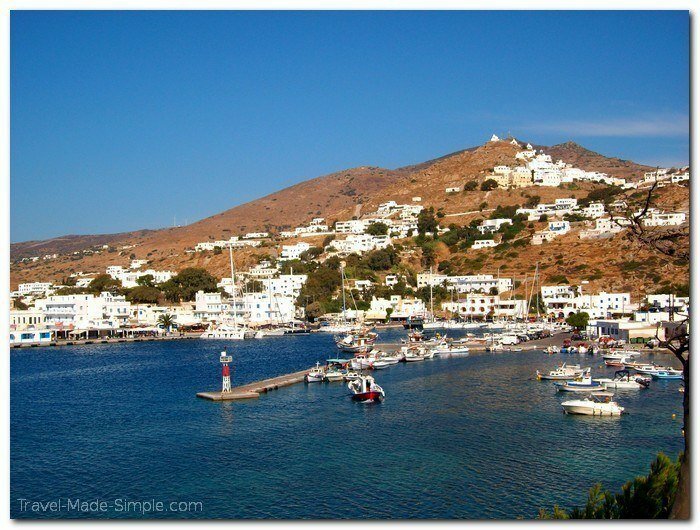 Then Wednesday morning, either take the ferry or fly to Naxos for the wedding. (Or if you’re more interested in the islands, only spend one night in Athens and get to Naxos on Tuesday so you have time to explore before the wedding.) I think 2 nights in Mykonos and 2 nights in Santorini is plenty to see the highlights. You probably need to be back in Athens Tuesday night if your flight is from there on Wednesday. So if you’re in Naxos Wednesday night (day before the wedding) and Thursday night, you could spend Friday night and Saturday night in Mykonos, and then Sunday night and Monday night in Santorini. You should look at ferries to get from one island to another, but flights to and from Athens will save you some time. Flights between those islands will generally connect back through Athens, and that’s kind of time consuming. Plus the views from the ferries are nice. I hope this helps! Hi….Thanks for your valuable advise. I am in greece from 31.5.19 to 7.6.19 and planning to spend my days in athens,santorini and mykonos. Kindly help me in distributing the days. My flight will reach at 20:25 to the Athens airport. Will I have enough time to catch a connecting flight to Santorini at 22:35 or 23:15 ? Is it safe for a family to land in santorini so late ? Hello! I wouldn’t worry about safety in Santorini. I think either of those flights would be fine. If you’re coming from outside the Schengen Zone, you’ll have to go through customs and immigration in Athens, but 2 or 3 hours should be plenty of time for that. Since either flight would put you in Santorini rather late, I’d recommend contacting your hotel and seeing if they can pick you up at the airport. Even if they charge for it, it’s a little less stressful than a taxi since they know exactly where to take you. 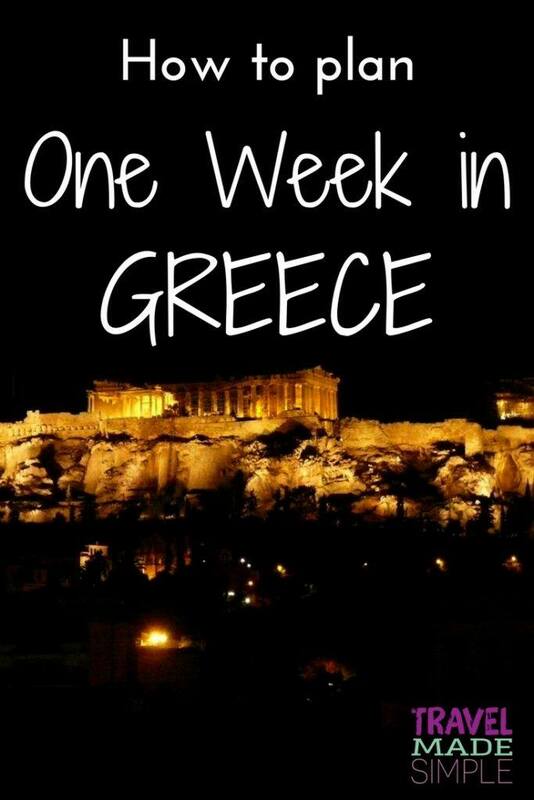 It sounds like you’ll have 6 full days in Greece, so 2 in each is probably the way to go. You’re best option for getting from Santorini to Mykonos is the ferry since a flight would have you connecting back through Athens. I have some info about Greek island transportation here. If possible, I recommend planning your transport from one place to the next either early in the morning or late afternoon/early evening, that way you’ll waste the least amount of your day.